Limoges plate, hand-painted with cornflowers. A Fair Young Decorator’s Husband Deals in Facts and Figures. A young housekeeper was exhibiting to an investigator a handsomely decorated plate which leaned against a neat easel on the mantel of her pretty drawing-room. “That shows what you know about it,” interposed the husband of the fair artist, with just a trace of sadness in his tones. “I don’t see why you say so, John,” retorted the latter. Mrs Daffodil’s Aide-memoire: China painting was touted as a genteel hobby, eminently suitable for ladies’ delicate hands and aesthetic sensibilities, although its proponents elided over the costs. Importers of fine china were also less than sanguine about the craze and had their methods for dealing with enthusiasts. Both dinner sets were of Limoges ware. They were displayed in a Broadway crockery house. The decorated set had delicate figures traced on each of the hundred or more pieces. “I assure you, madam, that it is genuine hand-painting,” he replied. “The slight difference in price does not arise from the cheapness of the painting. It comes from the highness of the tariff. This entry was posted in Fads, News and Announcements, shopping, Victorian and tagged china painting, china painting hobby, hand-painted china, Limoges china, Victorian china painting on April 10, 2019 by chriswoodyard. The suffragette costume will be a novelty of the winter fashions—the derniere cri—the United Ladies’ Tailor Association of America say, and they ought to know. The suffragette gown should meet the requirements of the most advanced suffragist. 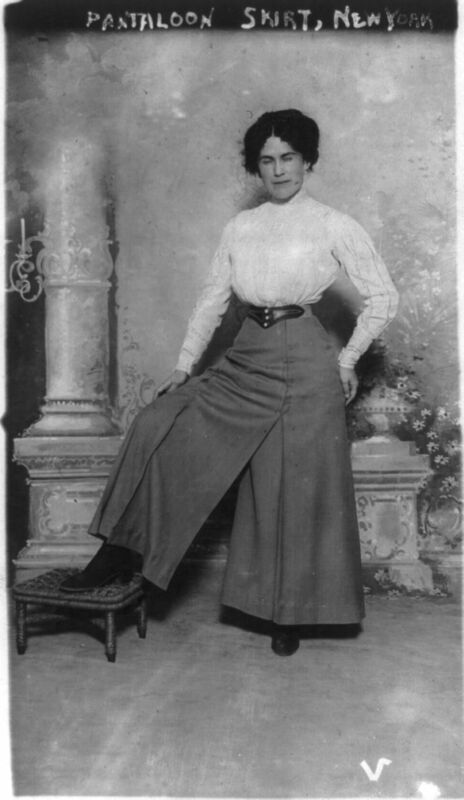 The skirt is made in two parts, like men’s trousers, but the deft tailor has been able to make it appear as if it were a diminutive straight lined tailor skirt, when the suffragette is not in action. On a manikin the skirt doesn’t in the least suggest trousers. It is made with hip pockets, so that if the suffragette wants to make a campaign speech she can keep her hands in her pockets man fashion. The tailor who designed it explains that the coat is a short, slightly fitted box affair with regulation men’s pockets, revers and lapel button hole. Another new corner in the world of fashion is the busy woman’s coat. A woman can start out at 6 o’clock in the morning wearing an evening gown and nobody will be the wiser, as this clever coat will conceal the fact. It is made with an envelope pocket in the back, where the train can be concealed, and it buttons up the back to hide the low neck gown. There are eight buttons on the coat. At noontime if the lady wants to lunch she can unbutton two buttons and change her coat into a smart tailor suit. At 3 o’clock, if she wants to motor, two more buttons are unfastened, a cape slipped up, and she has an entire change for autoing. At 5 o’clock, if she wants to take tea in her aeroplane, she can unfasten two more buttons, and she is ready to fly. At 6 o’clock she can undo two more and be dressed for a restaurant and at 9 o’clock she can check her coat and be ready to dance the rest of the night. Mrs Daffodil’s Aide-memoire: Mrs Daffodil has never understood why a suffragette’s costume was required to mimic that of the gentlemen. Who would be tormented by a high-starched collar or a stiff-bosomed shirt? Why the unalloyed fascination with bifurcated garments? Mrs Daffodil has never had any trouble performing the most arduous duties in a skirt. A skirt will swing and fall freely, whereas divided skirts have a troubling tendency to bunch. They seem double the bother of skirts. Then there is the question of pockets. Pockets are not the exclusive property of pantaloon-wearers. If a lady needs pockets, they may easily be added to her suit or gown. The dressmaker may raise her eyebrows, but you are the one paying the bill. And that bill might be shockingly high–not unlike the premium ladies still pay for quality clothing and for maintaining that clothing, such as dry-cleaners’ bills, which are higher for cleaning women’s articles than for comparable ones for men. 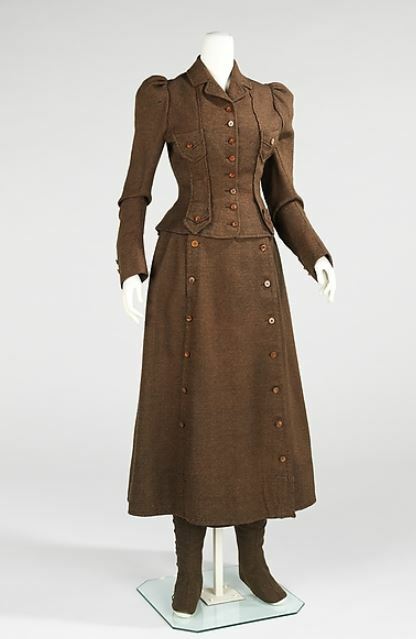 From New York comes the new of another model suffragette costume and it cost only $225, too! To Mrs. Alma Webster Powell of Brooklyn belongs the honor of designing it. She wore it for the first time at a suffrage meeting Thursday night. She says women are bound to adopt it. What could be more fascinatingly masculine? But the critical mind is compelled to note an interesting distinction. 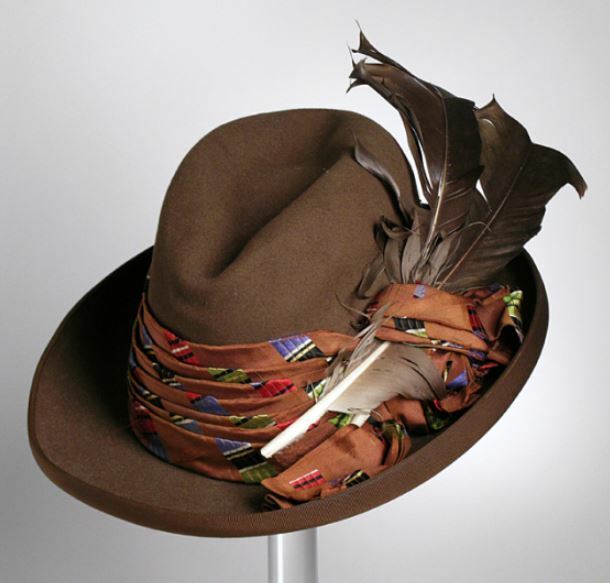 The suffragette costume tends, in respect to form, more and more to the masculine ideal. But in other respects, particularly as to price, they show no evidences of approach. To judge from Mrs. Powell’s $225 suffragette costume–and she has another for evening wear that cost only $375–and from the fact that the model female voter togs exhibited at the show of the New York Tailors association cost $175, they can never take the place of trousers. Trousers are accustomed to appear in show windows with such enticing legends as “This Nobby Pair Only $6”; or “Take Me Home for $5.75; or “Was $7. Now $4.35.” That is one of the most familiar commercial aspects under which trousers appear to the world at large. Imagine a typical suffragette suit, as they are being made and reported, attempting a similar show window role! “Very Nobby–Only $375!” “Special Sale Today–$225!” “Trousers Without Suffragette Coat–This Week Only $150!” The very idea is ridiculous. Who has not seen, at some time or other, an attractive sign “Mercury $3 Pants”–borne about town in a wagonful of brass band? Could the trousering, as expounded at present, expect to figure in a similar connection? Well, hardly! It would simply be a waste of money to hire a wagon and a brass baud to exploit a sign reading “Venus $375 Suffragette Suits.” or something to that effect. Why suffragette trousers should cost more than pants can ever hope to cost is not wholly clear. We only know they do. No suffragette costume yet reported sells for less than $175. That fact emphasizes the distinction between the gorgeous trousering and the simple, democratic trouser or common, plebeian pants. This entry was posted in Edwardian, Fads, Fashion, History 1910-1930, Irregular Lives, News and Announcements, shopping and tagged Edwardian fashion, pockets in ladies' clothing, Suffragette costume, Suffragettes, the cost of women's clothing, trousers for ladies, women in trousers, women's rights on February 20, 2019 by chriswoodyard. A recently engaged girl gave a charming valentine charm party to her young girl friends. The invitations were made of water-color paper, and were in the form of tiny padlocks, with a dainty key attached. A painted Cupid was on one side and the following words filled the other: “If thou wouldst know the secrets and charms of love which St. Valentine keeps under lock and key, meet at the mystic board at 29 Chestnut St., at eight o’clock, on February fourteenth.” After a session of girlish chatter, and a social game or two of “Hearts,” the guests were taken to the dining-room, which was hung with many-colored dangling hearts. Heart-shaped ices, “kisses,” “lover’s delight,” etc., were served. Garlands of vines, rosebuds and hearts trailed from the chandelier over the white cloth. The centerpiece was a mammoth crimson rose made of crape paper surrounded by ferns, and its heart contained as many petals as there were guests. Each petal was fastened to a white satin ribbon which led to each place. After the plates had been removed, the guests remained at table and the charms began, when each guest gently drew her streamer and its petal. The petal contained her fortune. The heart of the rose being drawn away disclosed a tiny Cupid in a white satin bride’s slipper. The slipper was filled with crape-paper rose leaves of various colors. Each guest received three leaves on which she wrote a lover’s name (a different lover for each leaf). and dropped them into her individual bowl of water. The first to come up was to be her future husband. On each place-card was found five bay leaves, a tiny crimson candle, two matches and a pencil. Then tiny cups of tea were brought in. The maidens wrote their wishes on the bay-leaves, lighted the candles and burned the leaves, so that the ashes fell into the tea. At a given signal the tea, ashes and all, was consumed, and thus St. Valentine’s help was insured for the gratification of the wishes. Each guest then received an egg, on the shell of which was written the name of her best love, with indelible ink. The eggs were boiled and each lassie claimed her egg. Then the yolks were removed and salt put in its place. The girls bravely ate the eggs, salt and all, while their wishes were made. If they retired without taking a drink of water, the person of whom they dreamed was to be lord of the future, and the wish would come true. The favors for the occasion were satin sachets with a garland of rosebuds and lovers’ knots painted on the surface. A long-stemmed crimson rose was pinned to it. In the heart of each rose was a tiny gilt heart with a quaint valentine verse on it. Mrs Daffodil’s Aide-memoire: What dainty accessories as a backdrop to the performance of ancient (and to be perfectly frank, rank) superstitions! Mrs Daffodil has written before about the Valentines’ rites and customs of yore in Holly Boys, Ivy Girls, Eggs, and Billets. The bay leaves were more usually pinned to the young lady’s pillows, but one supposes there are fads in love charms as well as Valentines. This entry was posted in Courtship, Fads, Frolics, History 1910-1930, Holidays, News and Announcements, Supernatural, Valentine's Day and tagged lovers' superstitions, Valentine's charms, Valentine's Day, Valentines' superstitions on February 13, 2019 by chriswoodyard.